This product is a daytime infrared image mosaic generated using Thermal Emission Imaging System (THEMIS) images from the 2001 Mars Odyssey orbiter mission. 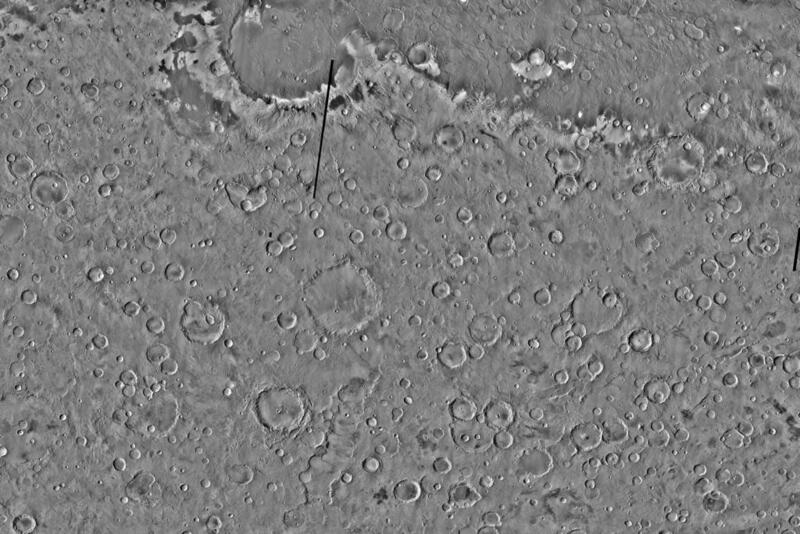 The mosaic is generated at the full resolution of the THEMIS infrared dataset, which is approximately 100 meters/pixel. The mosaic was registered horizontally to an improved Viking MDIM network that was develop by the USGS Astrogeology cartography group. This work is funded by the Planetary Geology and Geophysics (PGG) Cartography program to improve the registration of the THEMIS infrared dataset. These controlled mosaics and improved image pointing knowledge will positively impact both the work performed by the Astrogeology cartography group and a broad range of disciplines within the larger science community. Controlled THEMIS mosaics will benefit geologic mapping efforts (superior basemap), landed science operations (site characterization and traverse planning), and orbital observation planning (precision targeting). The control networks that result constitute a (potentially global) framework for the precision cartographic control of existing and future higher spatial resolution data products (e.g. CTX), and will allow the registration of historical data sets (e.g. Viking MDIM) to be improved. In addition, the improved imaging pointing kernels will be very valuable to scientists and allow them to perform quantitative analyses with THEMIS images using improved pointing knowledge as well as the precision and accuracy of that knowledge. All attempts were made to include all released Thermal Emission Imaging System (THEMIS) daytime infrared images within the bounding coordinates of the region in the control network and resulting mosaic. No filtering is performed to remove images where there is redundant coverage; all available images are included. Images were deleted from the control network (and therefore are not included in the mosaic) if poor image quality prevented the ability to resolve features and allow the image to be controlled. Areas within the mosaic that have gaps either have no THEMIS daytime infrared coverage at the time the mosaic was created or poor quality images were removed. The USGS Astrogeology Science Center has developed automatic sub-pixel registration and bundle adjustment software (pointreg and jigsaw) that are used to generate the THEMIS infrared control networks and are part of the ISIS software package. We utilized this software to perform automatic sub-pixel registration techniques with human oversight. We first automatically plan the placement of control points on a given set of overlapping images (seedgrid and autoseed) and automatically measure tie points in the specified area (pointreg). Given a well-known geometry, the automated registration software used to locate corresponding features in image pairs has been found to be very successful (i.e. a success rate of better than 95% in moderate to high thermal inertia regions). Using this automated software, we perform least squares bundle adjustment of control point image measurements and develop the individual, small control networks (jigsaw). We are also able to solve for the formal uncertainties of the position of each image in each control network, as well as any correlation between them, via inversion of the normal matrix. All of the control networks have average jigsaw residuals less than a single pixel, and the 3-sigma residual is also less than a single pixel. Thus, these mosaics achieve sub-pixel precision in image space. In many cases, the position of a single THEMIS image is adjusted by 5-7 pixels (equivalent to ~30 CRISM pixels, 100 CTX pixels, and >2000 HiRISE pixels), and adjustments as large as 15 or more pixels have been necessary. The accuracy of the final product (mosaics and improved image pointing kernels) is limited by the accuracy of the coordinate system we are using for ground control. Therefore, the horizontal accuracy of the final products relative to the MOLA topographic model ranges from 150 to 275 meters, which translates to 1.5 to 2.75 pixels. Controlling the THEMIS data for these areas has significantly improved the registration of the THEMIS images. This control network will improve the registration of the THEMIS IR data set, enhance our knowledge of image placement and the location of small-scale surface features, provide for improved targeting of current and future orbital acquisition of data, and allow for improved targeting of spacecraft landings. Seamless mosaics were generated using band 9 (centered at a wavelength of 12.57 µm) data at 100 meters/pixel scale, which is the full resolution of the THEMIS infrared data set. We began with PDS-released THEMIS reduced data records (RDRs) and used the updated impage pointing kernels generated from our control network. We utilized the THEMIS mosaicking procedure developed by Arizona State University (Edwards et al. (2011), Mosaicking of global planetary image datasets: 1. Techniques and data processing for Thermal Emission Imaging System (THEMIS) multi-spectral data, J. Geophys. Res., 116, E10009, doi:10.1029/2010JE003755), which uses DaVinci software scripts to post-process images ("uddw"), reduce image noise ("rtilt, " "deplaid, " and "destreak"), and remove seams between images ("blend, " "sstretch, " and a high-pass filter). The resulting mosaics are qualitative (8-bit) products. The nodata value for the mosaic is NULL.